Enter Our Social Media Sweepstakes for a Chance to Win a 1TB SSD! Do you have the need for HARD DRIVE speed? 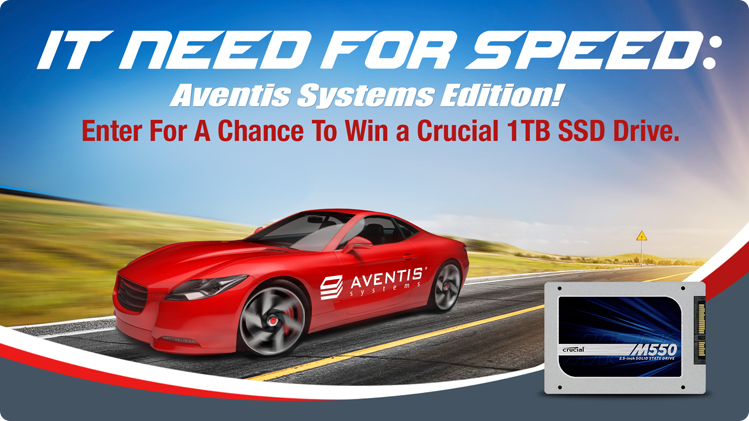 Aventis Systems is giving you the chance to win a Crucial 1TB Solid-State Drive! To be eligible to win, you must enter the sweepstakes by August 28, 2014. Our final winner will be randomly selected no later than one week after the sweepstakes end. The sweepstakes is open to U.S. citizens only. All sweepstakes participants have equal opportunity to win a Crucial 1TB solid-state drive valued at $500. The winner will be selected at random. SSDs have up to 100x greater throughput and nearly immediate access compared to traditional storage media. This means quicker bootups, faster file transfers, and better overall performance which equates to less wait time starting up and opening files or applications. SSDs also help open traffic flow to increase server and storage performance. With a wide range of applications and benefits, SSDs are smart investments for business looking to maximize performance, reduce cost, and improve overall operational flow. Don't miss your chance to win a Crucial 1TB SSD! Visit www.facebook.com/aventissystems to enter now! For sweepstakes rules, please click here.